The time has arrived to look for something worth cheering about with the 2014 Red Sox. The worst-to-first-to-worst scenario described in July as a train wreck is reaching the stage of a death watch. In 2012 the Red Sox posted the worst record in the modern era with 69 - 93 under the leadership of Bobby Valentine. In 2013 they turned it around 180 degrees and won the World Series with a record of 97 - 65. In 2014 they are cutting it close, currently with a record of 51 - 65, with only 46 games left for them in the regular season. They are winning roughly three out of seven games, which means they could conceivably finish well below the 69 winds that represent that dark and dismal time in 2012. 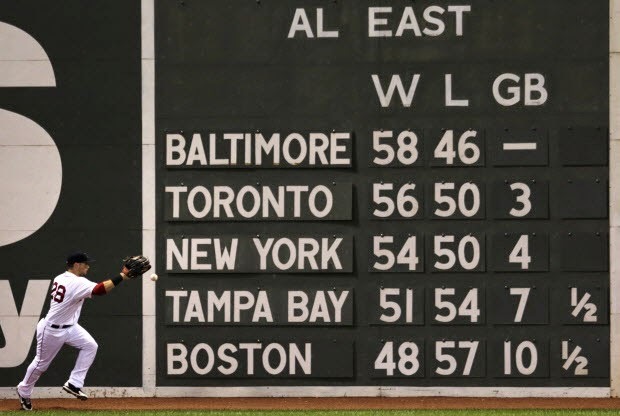 Will the Red Sox end up going from worst-to-first-to-worst in such a dramatic fashion? This can not happen, can it? It is time to watch closely and pull for at the least 70 wins, which requires 19 out of the last 46 games. The World Series manager John Farrell can't be put in the same breath as Bobby Valentine, can he? We will be watching on twitter and counting down to the salvation of passing the 2012 Red Sox record with a Twitter hashtag #beat2012RedSox.